We went to Spruce Run Reservoir in hopes of seeing horned larks, snow buntings and horned grebes that have been reported there. 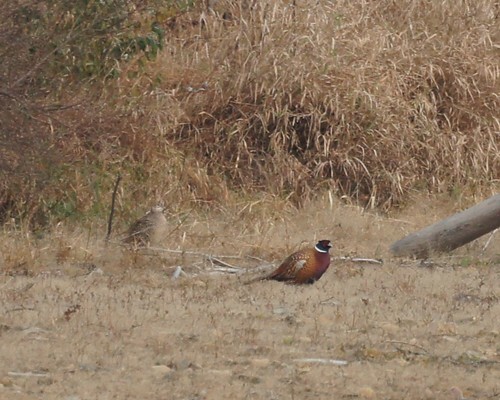 Instead, we mainly saw a lot of people with guns and these two pheasants. Backyard birding is safer on youth hunting day. Previous Posts Hooded Merganser: Photo by Rob Mike got a new camera!!! Birding in Wine Country Acorn Woodpecker Happy Halloween Clapper Rail Eastern Bluebird from Brigantine Hooded Merganser at Brigantine More Birds from Brigantine on a Lovely (but brisk)... Go Beavers!